Consumer conscious. Toshiba’s latest laptop touts solid multimedia-friendly features and specifications backed by a Core i5-2410M CPU, but cost-cutting doesn't do the Satellite any favors. Give Toshiba some credit for cutting straight to the chase. With its Core i5 processor - complemented by generous amounts of internal storage and memory - the newly announced Satellite P745-S4250 touts specifications aimed to draw in price and performance-conscious users. Plus, features such as the laptop’s harmon/kardon branded speakers clearly look to define the “P” in the Satellite’s model name as “premium.” Is the Satellite P745-S4250 worth a purchase or should it stay earthbound? Keep on reading to find out. Physically, the Satellite P745-S4250 offers few surprises. At 2.44 kg, it falls near the middle of the pack compared to similarly built 14-inch laptops such as the Dell Latitude E6420 (2.67 kg) and Sony Vaio VPC-CA1S1E (2.31 kg). 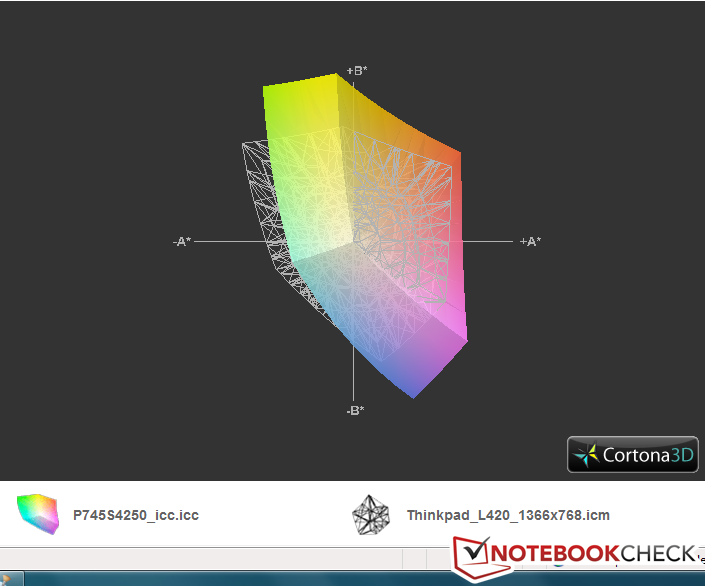 In terms of dimensions, the laptop is also similarly unremarkable. At around 28 mm to 36 mm thick – depending on whether or not the laptop’s display is closed – it’s not impossible to transport in a backpack or messenger bag, but no one’s likely to confuse it for a MacBook Air any time soon. 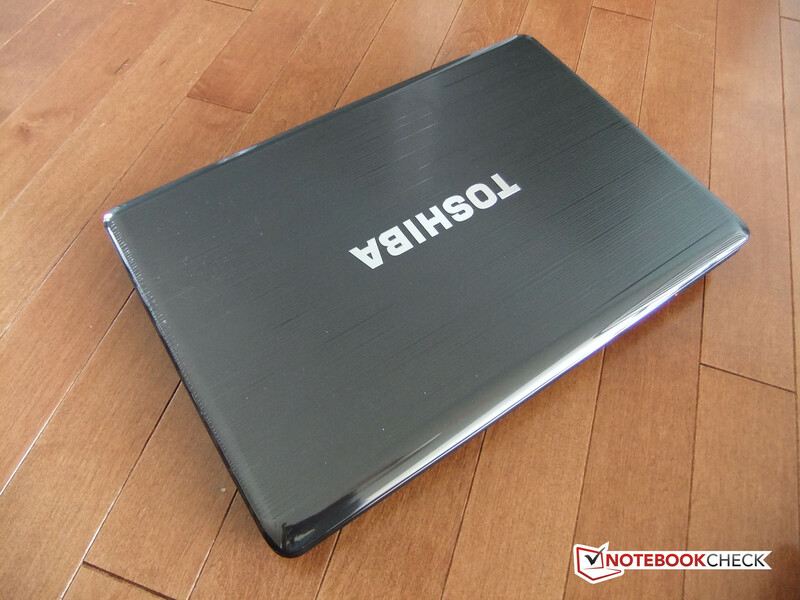 The laptop’s black and charcoal grey color scheme also gives it the same industrial chic visual scheme that’s common among most consumer-level laptops, but we’re not enthused about Toshiba’s heavy reliance on plastic, which is used on the entire laptop. Even though the Satellite’s pseudo-brushed aluminum finish on the keyboard deck and display adds some aesthetic sharpness, plastic simply doesn’t provide much support when it comes to durability. The laptop had significant amounts of flex at multiple points on the laptop’s display and body when light to moderate pressure was applied. Plus, when the Satellite P745-S4250 is compared to other similarly priced laptops, Toshiba’s decision to go with an all-plastic body seems especially confusing. For instance, the 14-inch HP ProBook 4430s touts a brushed aluminum keyboard deck and display, but its Core i5-based version still clocks in at $50 USD less than the P745-S420’s U.S. price tag. Beyond this, though, the Satellite P745-S4250’s construction is consistent and mostly solid. Thankfully, the laptop eschews any display locks, making it easy to open and close the computer. The weight of the display also holds it down against the keyboard deck – we didn’t see any discernable magnetized locking points on the display, but it’s secure enough to ensure against having it accidentally open. That being said, the small gap between the display and keyboard deck is large enough to potentially have loose objects wedge the screen open. If you’re carrying the laptop in a backpack with lots of other objects, we’d definitely spring for a protection bag or storing it with the spine facing upwards. Additionally, several rubber stoppers are placed along the screen side of the laptop’s display to prevent it from hitting the keyboard deck – these black stoppers easily blend into the laptop’s display and are hard to notice. The Satellite’s underside also features screwdriver-removable covers that provide access to the laptop’s memory bays and hard drive slot. Both areas are easy enough to identify, though we had to be careful when removing the covers. They’re attached to the laptop via several plastic hooks and secured well enough that a misdirected removal tug could easily break them off. While the Satellite P745-S4250 features the standard array of ports and networking standards found on most consumer-centric laptops, it’s not without a few surprising omissions. First off, what’s included: beyond the usual VGA, HDMI and headphone jacks, among others, the laptop also features a single USB 3.0 jack on its right-hand side. In terms of port placement, there are no major issues – the port selection isn’t especially elaborate, but the ample space along all three sides of the laptop makes cable clutter unlikely. A memory card reader on the front of the P745-S4250 also provides support for Memory Stick, SD and xD cards. Along with Ethernet and standard Intel 802.11 b/g/n Wi-Fi, the Satellite also touts support for Intel Wireless Display, which allows users to wirelessly use a compatible display as a secondary monitor. Inexplicably, the P745-S4250 doesn’t feature support for Bluetooth out of the box. Users with Bluetooth accessories will have to turn to third or first-party solutions and for the latter, it certainly doesn’t run cheap. On Toshiba’s online store, a Bluetooth 2.1 USB adapter will cost an additional $29.99 USD. It’s certainly fair to argue that most Bluetooth add-ons have identical USB-based counterparts, but at this price point, omitting features like Bluetooth connectivity seems unnecessarily stingy. Eco Utility, Toshiba's power management application. One of the pop-up ads we saw during testing. Toshiba’s Sleep-and-Music and Sleep-and-Charge both offer some nice multitasking functionality for music aficionados or gadget users. Sleep-and-Music allows you to use the P745-S4250’s speakers as a backup sound system by connecting an MP3 player into the laptop’s Line-In jack, even when the Satellite is turned off. As an alternative speaker, the 14-inch Satellite certainly isn’t the most practical solution – our smartphone’s speaker was actually louder by itself compared to when it was connected to the laptop - but it’s still a nice design addition for when additional amplification is needed. Sleep-and-Charge also lets the Satellite double as a portable charger for any USB-based devices, even when the computer is in standby or turned off. Both of these functions are controlled by an easily accessible application within Windows. The Satellite also features the expected array of bundled third-party demos and first-party software. 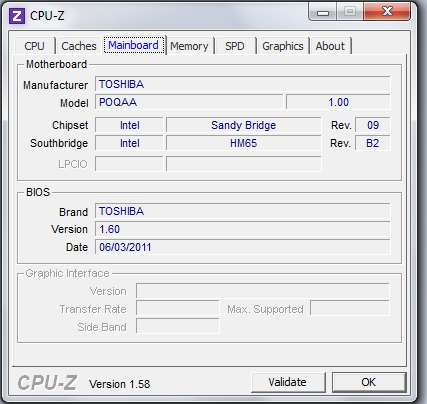 Besides trial versions of applications such as Microsoft Office 2010 and Norton Internet Security 2011, Toshiba also included its proprietary software suite, which covers functionality ranging from system maintenance to power usage monitoring. The amount of use that you’ll get out of these programs will likely depend on if you already rely on an alternative application. For instance, Toshiba Book Place is Toshiba’s own eBook store – the application features convenient integration with Windows-based computers and Android tablets, along with a surprisingly current selection of available books. Some of the titles on sale included Kathryn Stockett’s “The Help” and “Flash and Bones” by Kathy Reichs. By contrast, we can’t imagine that users will get much use out of applications like Toshiba’s App Place. Like Apple’s own App Store on its computers, the App Place features applications available for purchase, but with a relatively sparse catalogue, users might be better off going directly to the developer’s website. We also weren’t fans of Toshiba’s approach to promoting its App Place application – while we were testing the P745-S4250, a benchmarking run was interrupted by a pop-up ad for App Place. To be fair, we were able to disable future pop-ups for App Place within the actual ad – though a new pop-up ad for Toshiba Online Backup appeared a few days later - but having to deal with them on a laptop that’s ostensibly targeted towards non-budget users feels unnecessary and annoying. The P745-S4250 doesn’t feature much beyond the ordinary when it comes to accessories. Beyond the included AC adapter and bundled six-cell battery, Toshiba also sells an USB-based docking unit and a high-capacity 12-cell battery. 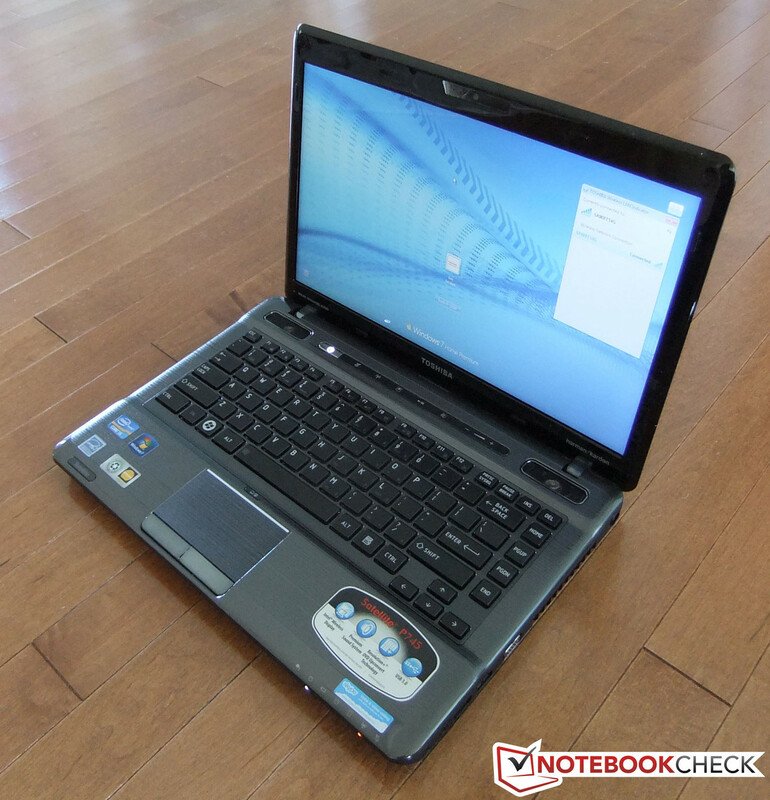 However, the larger battery does protrude from the laptop’s chassis and raises the angle of the keyboard. As for the 0.3 megapixel webcam, visual quality is as expected. Video and image fidelity is, at best, mediocre, but it’s adequate for basic video conferencing. 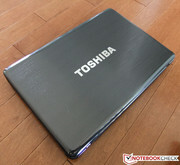 Toshiba offers a one-year standard and international limited warranty on the P745-S4250. 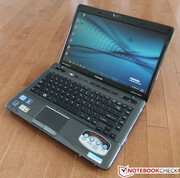 Parts and labor - along with the laptop’s battery – are also covered under another one-year warranty. The Satellite’s 8.25 cm x 5.1 cm touchpad provides decent amounts of physical real estate for scrolling or other functions. Support for multitouch gestures is also included, though most of them have to be manually enabled through Control Panel. Our fingers also had few issues with clicking or moving alongside the touchpad’s smooth matte finish – the Touchpad’s two keys were extremely quick and responded well to presses. 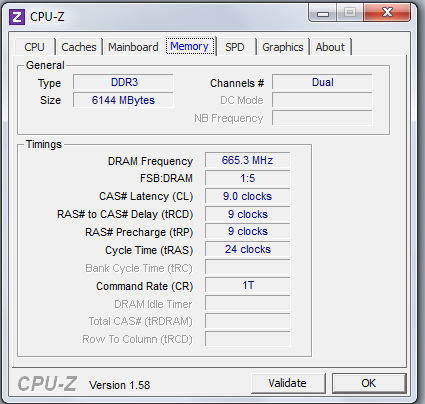 In terms of performance, the P745-S4250’s flattop keyboard offers few major surprises. On the individual keys, their responsiveness and size were both extremely comfortable. Plus, the laptop also managed to squeeze in a “Home,” “Page Down,” “Page Up,” “Delete” and “End” key at the far right end of the keyboard deck. Thanks in part to the size limitations of a 14-inch notebook, the keyboard does make ample use of the “Fn” key – not including the “F1” through “F12” keys, everything from a secondary volume control option to an entire number pad is integrated within the keyboard. While the extra functionality is always appreciated, we’re split, in part, because of the extra aesthetic noise the secondary functions add to the keyboard (having one key do triple duty as an “I,” “5” and Left arrow key, for instance). Similarly, we’d rather take a backlit keyboard over the heavy amounts of Tron-like illumination on the touchpad, Satellite logo and function bar, though it’s easy to disable through a single button press. Plus, having the backlights gradually fade out when disabled is a nice added touch. The Satellite’s display – which features LED backlighting and a 1366 x 768 pixel resolution – runs near the middle of the pack when it comes to visual fidelity. 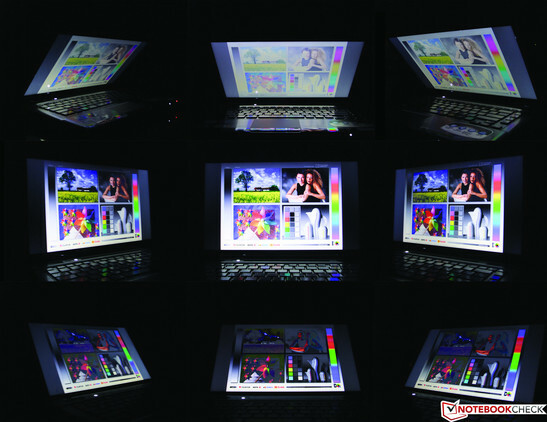 To the screen’s benefit, brightness performance is solid, with an average of 244.0 cd/m2 among all nine of the display quadrants. However, with an unspectacular contrast ratio and a black value that’s higher than ideal, other performance areas are less than impressive. 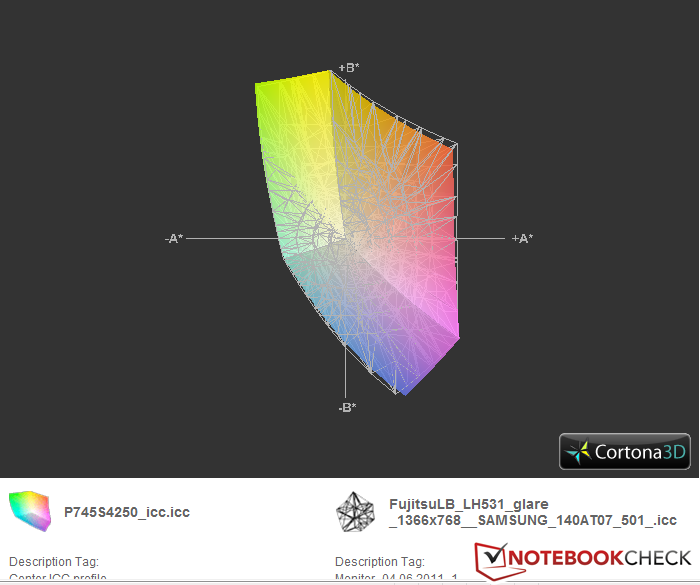 By examining the P745-S4250’s color space coverage, we can see this in action. 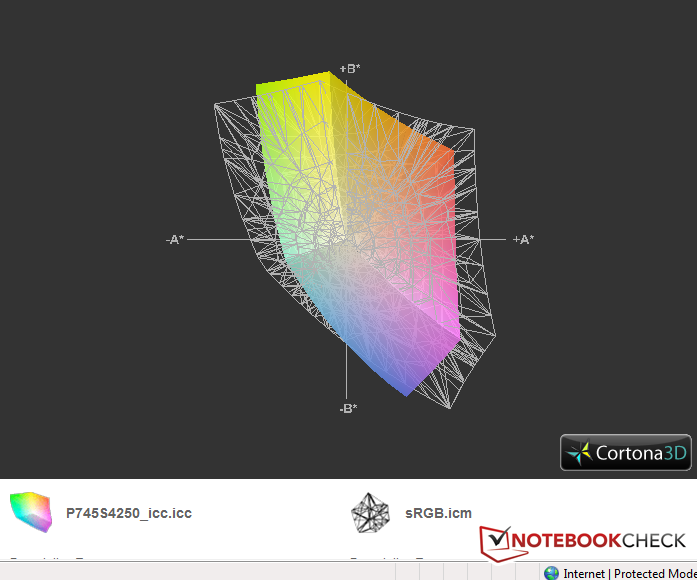 Against sRGB, significant amounts of spectrum are left uncovered. 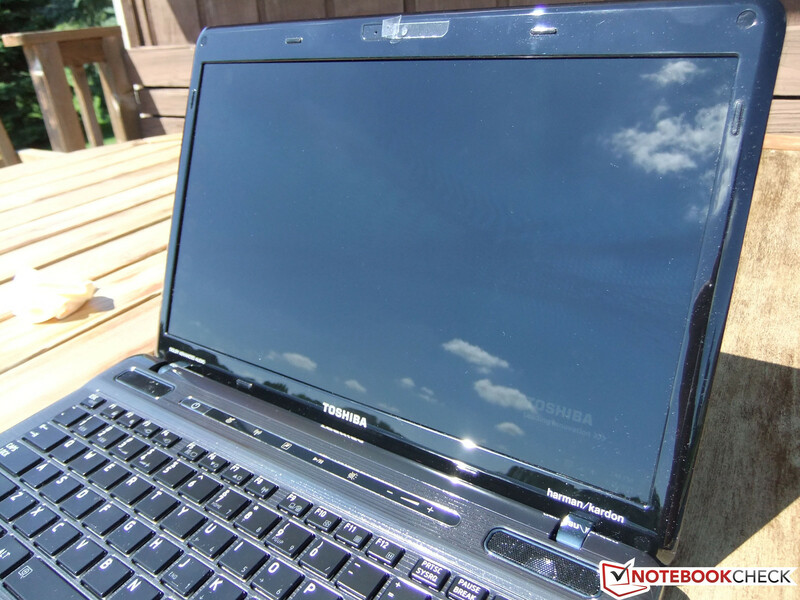 However, when compared against similarly built laptops such as the Lenovo ThinkPad L420 and Dell Vostro 3450, the Satellite does fair better with larger amounts of coverage. If you’re planning on working outdoors, the Satellite does offer respectable levels of sun resistance. With the brightness maximized within Windows, we managed to get decent levels of visibility out of the display. As the photos show, though, the screen’s gloss did it few favors when outdoors – the sheen rendered it virtually unusable at several different angles relative to the sunlight. At others, visibility was average to mediocre. By comparison, the display’s viewing angles fare much better. While visual distortion was easy to pick up when the screen was pitched back at a 45-degree angle, it could only been seen at certain viewing positions when the display was mounted at a right angle. When the screen was pointed at around 45-degrees inward, we saw few signs of onscreen issues. 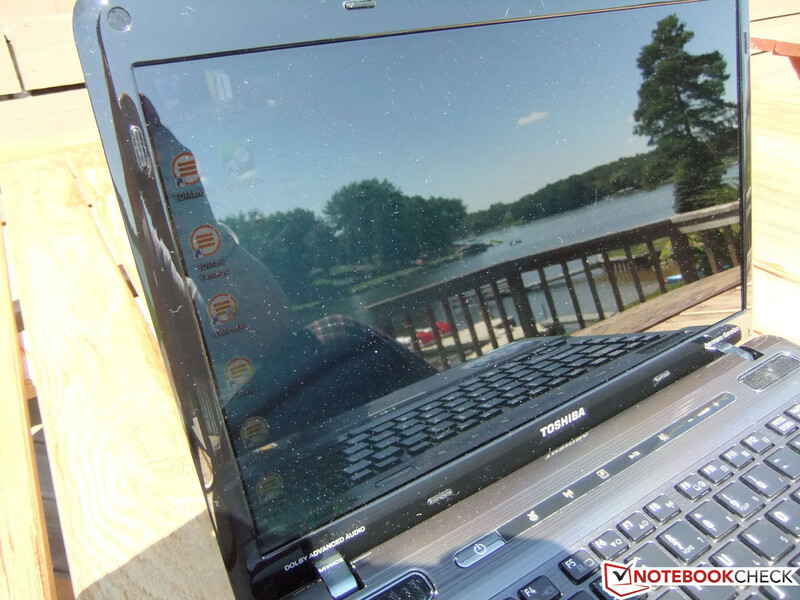 Frequent webcam or Bluetooth users could be forgiven for feeling shortchanged by the P745-S4250, but when it comes to performance, Toshiba cut few corners. Besides its Core i5-2410M processor, the Satellite also features 6GB of DDR3 RAM and a 750GB 5400RPM hard disk drive by default. In action, though, the overall picture is somewhat muddled. 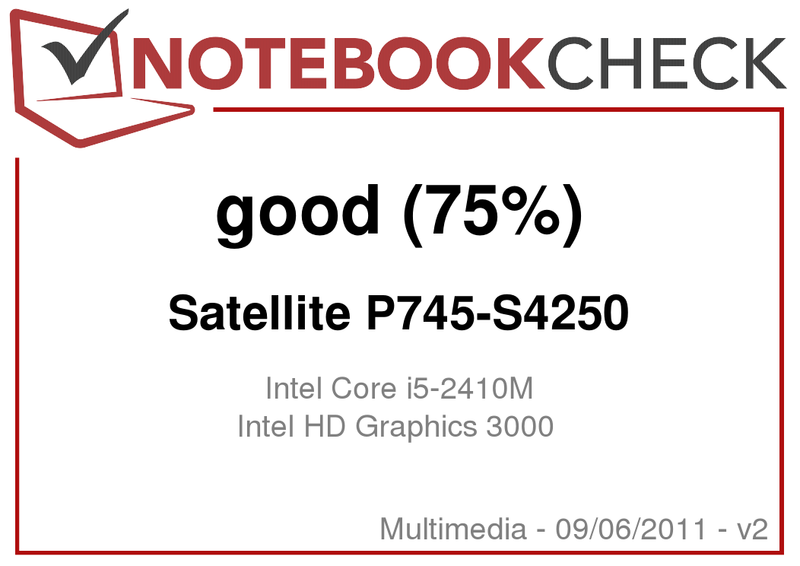 Within PCMark Vantage, the Satellite scored 5960 points, which was slightly below the category average of 6393.7 points among Core i5-2410M based systems. In PCMark 7, the laptop’s score of 2110 fell right next to several other laptops sharing a Core i5-2410M or Intel HD Graphics 3000 GPU. 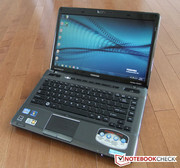 Surprisingly, the P745-S4250 managed to eke out a higher score compared to similarly built laptops such as the Lenovo ThinkPad L420 (1961 points) and Toshiba Satellite L755-14P (2090 points). Against laptops such as the Toshiba Satellite R830-11C (2936 points) and Dell Vostro V131 (2359 points), though, the P745-S4250 fell significantly behind, despite sharing the same GPU and CPU. Within Cinebench 10 and Cinebench 11.5, we found much more to like from the Satellite’s performance. In Cinebench 10’s single and multithreaded CPU rendering tests, the P745-S4250 blew past our category averages by significant margins. With scores of 4629 points and 9732 points in the single and multithreaded tests, respectively, the laptop was close to breaking the performance ceilings previously set by Core i5-2410M based systems. Results in Cinebench 10’s shading test were less than spectacular, thanks to clear performance bottlenecking from the Intel HD Graphics 3000 GPU. 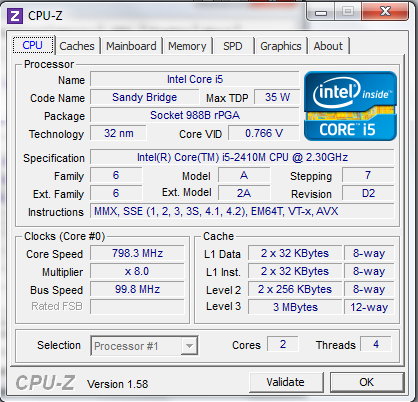 Other Core i5-2410M based laptops such as the Dell XPS 15-L502x (5600 points) and the Sony Vaio VPC-CA1S1E (6472 points) scored much better, thanks to their dedicated GPUs. Competitors like the Fujitsu Lifebook LH531 (5388 points) – which shares the same GPU/CPU combo – featured near equivalent performance. 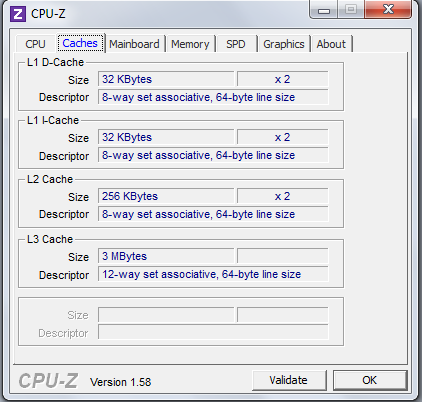 Cinebench 11.5 results were similarly consistent. 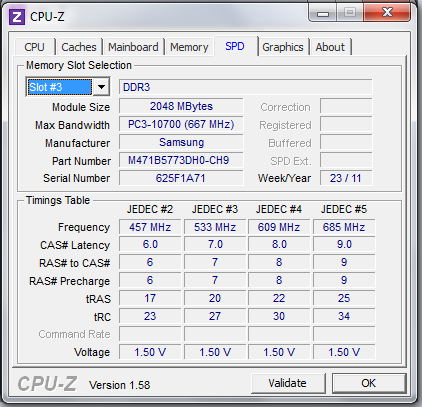 The P745-S4250’s CPU score of 2.6 points places it right into the middle among Core i5-2410M systems. Likewise, the laptop’s OpenGL score of 8.8 fell among the lower end of systems that shared a Core i5-2410M CPU and Intel HD Graphics 3000 GPU. Thanks to the Satellite’s use of integrated graphics and generous amounts of RAM, benchmark results within 3DMark Vantage and 3DMark06 were respectable, if unspectacular. 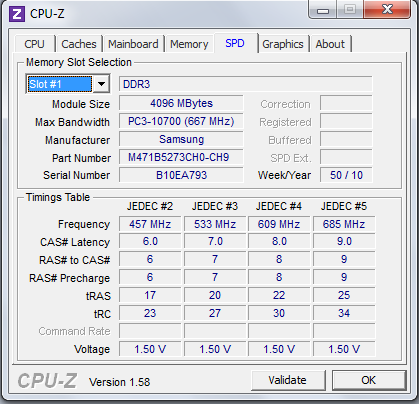 Surprisingly, the P745-S4250’s 3DMark06 score of 4471 points beat out other similarly built laptops such as the Dell Latitude E5420 (3330 points) and Fujitsu Lifebook LH531 (4069 points). Of course, competitors like the Dell Vostro 3450 (7269 points) and Lenovo ThinkPad Edge E420 (6432 points) – both rely on separate GPUs – outperformed the P745-S4250 by significant margins. 3DMark Vantage scores were largely a nonfactor – at 1864 points, the Satellite managed to beat competitors such as the Lenovo IdeaPad Z370-M5657GE (1704 points) and HP ProBook 6360b (1575 points). 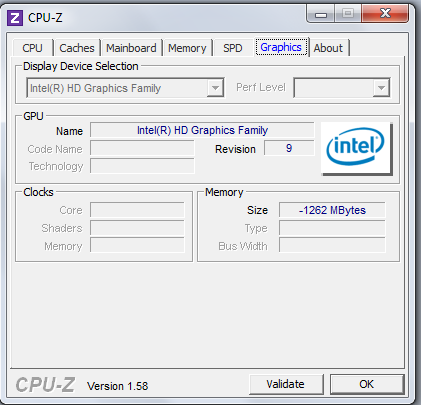 However, the mediocre graphics processing performance easily restricts the laptop from most graphics-intensive tasks. The performance we saw from the Satellite’s 750GB 5400 RPM hard drive wasn’t especially spectacular. 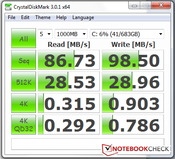 With most consumer-orientated laptops sporting SSDs or 7200 RPM hard drives, benchmarking results were marginally slower in HDTune and CrystalDiskMark 3.0. Performance in DPC Latency Checker was average – during our testing period, we saw higher latency peaks at several intervals. Thanks to the laptop’s midsized form factor and limited fan use, operating noise is not a major problem. The Satellite’s lone fan vent – which takes up around a third of the laptop’s right-hand side – cycles out large amounts of air that gets drawn from the computer’s underside. Even while it’s under load, though, the amount of noise produced by the P745-S4250 never becomes overtly noticeable. However, this minimalist approach towards ventilation likely plays a role in the Satellite’s heat retention capabilities. As with every reviewed laptop, we put the P745-S4250 through an hour-long stress test where Prime95 and Furmark were simultaneously run. Following this, temperatures on the keyboard deck jumped by around five degrees Celsius on multiple regions, though it never became uncomfortably hot. The laptop’s underside did see more drastic temperature increases – the area underneath the Satellite’s exhaust fan jumped by more than nine degrees Celsius and the air being pumped out was nearly as warm as a typical space heater. Needless to say, if you’re planning on doing large amounts of processor-intensive work, we’d recommend keeping the Satellite on a desk. (-) The average temperature of the palmrest area of similar devices was 29.1 °C / 84.4 F (-3.7 °C / -6.6 F). Considering how low of a value most notebook manufacturers place on audio fidelity, we’re especially enthused that Toshiba made sound much more than an afterthought on the Satellite. The laptop features two harmon/kandon speakers mounted on the edge of the keyboard deck and both provide phenomenal sound quality. Distortion and mids came through perfectly on songs like The Black Keys’ “Howlin’ For You” while songs such as LCD Soundsystem’s “Us v. Them” showed us that it’s possible for bass to exist on a notebook speaker. Of course, the speakers’ sonic range had its limitations - on less bass-heavy songs such as Vampire Weekend’s “Cousins,” highs were overly easy to pick out in the mix. Still, considering most notebook owners now take tinny, low fidelity sound as a given, we’d readily hope that speakers as sharp as the Satellite’s become the norm. For the most part, the results of our battery stress tests lined up with Toshiba’s own results. All of our tests used the stock six-cell, 48Wh battery. Under BatterEater’s reader test – where the laptop is made to cycle through a block of text without Wi-Fi and minimal brightness – the laptop lasted for six hours and six minutes. Within MobileMark Productivity 2007, Toshiba rated the battery at a maximum lifespan of five hours and 58 minutes. Under more intensive tests, battery life took a minor dip. Through casual use – we did a combination of document reading, video streaming and web browsing – the Satellite lasted for three hours and 55 minutes. After continuously watching episodes of the NBC show “Community” on DVD with Wi-Fi disabled, we eked out four hours and 38 minutes of battery life from the computer. And as expected, heavier stress testing easily ate through the battery’s charge. Under BatteryEater’s classic test – where a battery is rendered in OpenGL while simultaneously disabling most of the computer’s battery-saving measures – the laptop barely managed to last slightly more than an hour. Ultimately, the Satellite P745-S4250 feels like an exercise in difficult compromises. The laptop managed to produce some of the best benchmarking scores we’ve seen from a Core i5-2410M based system, along with excellent sound performance and decent visual fidelity. On the strength of its solid specifications, the Satellite is perfectly suited for non-gamer consumers who want a laptop that can tackle both multimedia and resource-intensive applications. At the same time, these strengths are significantly undercut by the shortcuts Toshiba took elsewhere on features and cost. We understand that consumer-level laptops can’t include everything if they want to maintain a competitive price tag, but it’s equally perplexing when cheaper laptops have better features such as metal cases or more connectivity options. And really, that’s the most disappointing part of the Satellite: there’s clearly a good laptop buried somewhere within the P745-S4250, but all of the Satellite’s caveats make it difficult to recommend. - Low quality approach on webcam, Bluetooth, etc. Charging extra for Bluetooth and a 0.3 megapixel webcam?